When the world is cold, the will is warm. A healthy dose of coffee and staying busy with seeding schedules, field plans, chicken chores, and seed orders (see photo) help keep me from getting lazy during the month of January (the moon of Excel). Secondly, we are super pumped to be sourcing our meat share from a new farm this year. 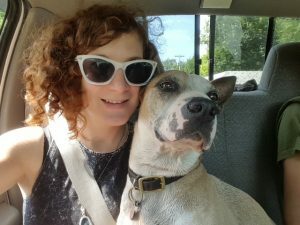 Katie Steere, currently from Chepachet, soon to be relocating to Cranston, runs an impressive livestock operation and is offering her products at a discount to our CSA members. 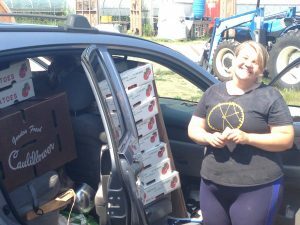 These shares (half or full) will allow our members to shop directly off of Katie’s website and receive delivery once/month to our CSA pick-ups. 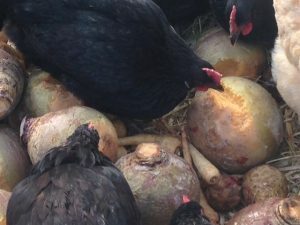 Check out Deep Roots Farm for more info about Katie and her products. Hope Everyone is doing well and looking forward to snow which hopefully will be coming soon. Best Wishes as the new year chugs along. Get cold, get warm, and stay productive. On December 12th 2018 an article was published in the journal Nature which concludes that due to the poor productivity of organic agriculture more land is required to grow food when compared to conventional methods. According to this article, and Stefan Wersenius of Chalmers University in Sweden who held a related press release, organic farming is responsible for global deforestation rates accelerating because of this inefficient use of agricultural land. Looking at Swedish farms they found that pea production was 50% higher on conventional farms compared to organic farms. They extrapolate this to organic meat production, which requires organic grain, which compounds the impact on climate change for the worse. Most of what people believe about organic farming can be categorically disproved depending on what your sample looks like. For instance, many people understand the term organic to mean, at it’s core, an abstention from pesticide use. This is true for many successful organic farms. It is also not true for many organic farms. The same is true for nutritional values, fertilizer utilization, and carbon sequestration. Studies have shown that organic produce has no benefit in nutritional value when compared to conventional produce. This would not come as a surprise to many of us who see large scale organic production as being nearly indistinguishable from conventional ag. The more similar an organic operation looks to a conventional operation the more likely they are to use pesticides and be nutritionally poor. But within this large tent of organic agriculture (where many, many natural growers no longer feel comfortable) we find hiding in the corners the promises that organic farming has been making made good. When enrolling the farms for this study in Sweden, did the researchers choose two paradigms of agriculture to compare? According to the press release the striking difference between the two systems (organic vs. conventional) was that the organic farm did not use fertilizer. Considering that these farms almost certainly both employ tillage, and one farm is not using any supplemental fertilizer, organic or not, are we surprised that their yield was 50% lower than the conventional method? No, the comparison is uninteresting because it represents two sides of a conventional paradigm, one conventional and one conventional-organic. Conventional organic being a farming system that employs tillage, minimal soil building techniques, and will often include NOP (organic) approved pesticides and fertilizers. What needs to be demonstrated are the results achieved through harnessing soil buildings programs. The research study I’m interested in reading compares the farms observed in the Nature article next to Gabe Brown’s farm in North Dakota. Or Singing Frog’s farm in California. Or Polyface farm in Virginia. Or Scratch Farm in Rhode Island. Or Tobacco Road Farm in Connecticut. I want to see the metrics applied to people working under David Johnson from NMSU’s consultation. Or Elaine Ingham’s consultation. These people and farms are on the cutting edge of what is possible in production as well as climate change mitigation through carbon sequestration. Gabe Brown is a rancher from North Dakota. Brown transitioned his farm from a conventional approach that incorporated tillage and synthetic fertilizers to a method people refer to as “biological farming”. Biological farming falls within paradigms of what people might consider to be organic farming. That is to say some organic farmers are biological farmers, some organic farmers are not and vice versa. This digression becomes complicated because the term organic is today both a very technical term as well as a figurative term. For the sake of convenience let’s refer to Gabe Brown’s farm as biorganic. Brown’s system now incorporates no till cover cropping and row-cropping methods with mob grazing methods for beef cows. In a telling by Brown of a corn crop he grew in 2009 in his biorganic system he refers to a soil test that showed he had 10 units of nitrogen available in his field. Corn needs approximately 150 pounds of nitrogen per acre (according to Knott’s Handbook). If Brown’s units of nitrogen are ppm (parts per million) than he is seven and one half times deficient in nitrogen. If his units are lbs/acre than he is fifteen times deficient in this field to grow corn. Despite these supposed deficiencies reported in his soil test Brown was able to grow corn in this field that beat his county average. That average was, according to Brown, “just under one hundred bushels per acre.” On this biorganic field Brown was able to grow 142 bushels/acre. That is without conventional or organic fertilizers “of any kind”. 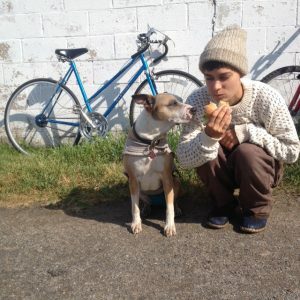 I’d like to know why methods like Gabe Brown’s are not documented and analyzed by researchers who, and I don’t doubt their sincerity, want to explore the ways in which different farming methods effect the environment. 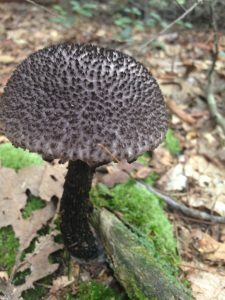 Such a striking difference in the example of Brown’s ranch to both the conventional and the organic practices studied in the Nature article demonstrate that we are looking at something different. These are the models that need to be measured against the current conventional and conventional-organic models. Within these systems are all the promises that organic farming has not been able to keep: farms that are water efficient, soil building, carbon sequestering, and just as important: beautiful places that stir imagination, provide nourishing food, provide livable incomes, and can bring us food security in the here and now. There is so much to say about Sally Lee. I’m fortunate to have known her parents so as to understand a little better where she came from. 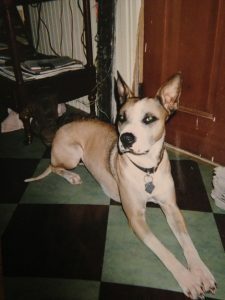 Her mother, Shiva, was my friend Rusty’s dog and her dad, Dante, was Willa’s. Shiva had several litters with Dante in a fairly short amount of time. My friend Marc can verify some of these details (they are a little fuzzy in my mind after thirteen years) but I recall the first litter consisted of eleven puppies. Each successive litter produced fewer puppies and Shiva took less and less interest in them. Anyway, not to drag my friends through the mud of being irresponsible pet owners since coincidently this union produced the best friend I have ever had. Sally was from Shiva’s first litter and had her markings (fawn colored). 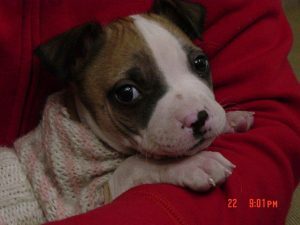 I picked her out the day after she was born and named her that day. Marc reminded me that I used to come over as often as I could to check on her and I pulled the bigger pups off of Shiva so that Sally could nurse. Sally spent the first year of her life on Simmons Farm, where I used to work. She had several friends there including Jack, the Simmon’s border collie, and Larry and PeeWee, Mis’s two miniature dachshunds. Sally then moved up to Providence where she and I lived at different locations until moving to Scituate in 2011. Starting Big Train Farm in 2008, Sally spent virtually everyday with me on the farm. Whilst living on the west end we would make visits to a dog park behind Bell Street Chapel. Through Sally I met Ray Perrault at the park. He recommended I host my CSA program at Eddy Hall in Bell Street Chapel, which I’ve done since 2009. Ironically I was guest minister at Bell Street (at Ray’s request) last weekend (Dec 2nd, 2018) where I was able to give Sally a small tribute for bringing BSC into my life. The next day Mindy and I put her down at Scituate Animal Hospital. Through her long career with Big Train Farm I always wrote off her expenses on my taxes. She was a huge help to my farming career in practical support and emotional support. She was in charge of pest control of which she performed honorably and faithfully. She was also my Moral Booster in Chief and tasked with welcoming people to the farm and making people feel comfortable there. I will never be able to live up to or replicate the warmth and generosity that Sally could provide to people so easily. Her gentle nature and joyful charisma was experienced by so many people who have visited or worked on the farm with us. These are some of her irreplaceable virtues that we will deeply miss. Dogs provide a consistency to our lives that I’m not sure any other creature can. Dogs, although adaptable through training, are who they are and offer a predictability that we can’t expect from people. Loyalty is a term used to describe dogs and it’s true that many dogs are loyal in the sense that they are attached to their owners. But dogs are also loyal in their character and, even more profound, so forgiving of our own lack there of. Sally has seen me at my worst and at my best but she never wavered in her consistency. 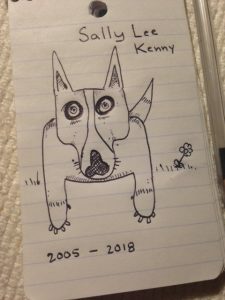 I know that kind of character is very special and I concede that despite all the training Sally endured with me she was good already in her heart. We put up with a lot together. After popping two vertebrae in her back she went through major surgery in 2013 which severed the nerves that controlled her bladder and her colon. It was my duty to squeeze this fifty pound dogs bladder three or four times a day for the last five years. 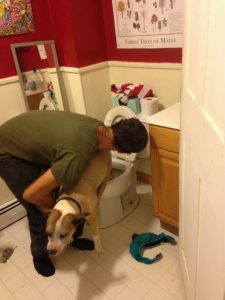 Bent over the toilet with her tail bobbing a few inches from my face I would lift her up and squeeze below her rib cage to push out as much urine as I could and, if lucky, a few stubborn turds as well. Luckily Sally was able to regain her mobility after surgery but she was never the same afterwards. The little dog who used to be able to jump from a standstill into the open window of my Silverado now had to be carried up and down our narrow staircase at our apartment in Scituate. With the acquisition of our new property in Chepachet Mindy and I had always looked forward to having a comfortable place for Sally to spend the remaining years of her life. Having a one-story house allowed us to open the front door and let her out without having to navigate the formidable stairs of our apartment. At our wedding my friend Jim looked around and said: “It looks like Sally finally made it to the promised land.” It was really satisfying to be able to have her here, on the new farm, for nearly a whole year. She got to lounge on the hot days in an air conditioned room that Mindy set up for her, and was always able to check-out whenever she wanted to. As always I feel very lucky to have a community to share these kind of things with. So many of you who knew Sally have been inspired by her. Some of you have sought out dogs that remind you of her. Some of you have worked with her and some of you have traveled with her. Many of you have enjoyed pictures posted on the blog or through Mindy’s instagram accounts. I’m sad to report that she will not be with us for the trials ahead but she will always inspire me to be a better person even though she holds up an unobtainable bar. 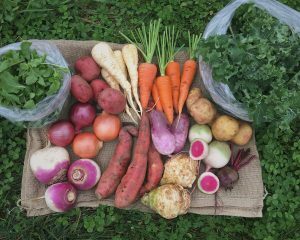 This post is intended as a big THANK YOU to our CSA customers who gave a little extra money (and sometimes a lot extra!) on top of their CSA Shares in order to support Crossroads RI. 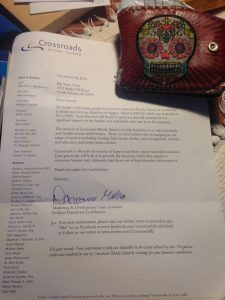 Crossroads operates their kitchen with a very tight budget that is supplemented with crucial donations. A typical problem for the cooks is not being able to anticipate what is going to be coming through the door on any given week (as far as ingredients are concerned). With your donation we were able to communicate with David, the head chef at CRRI, and allow him time to look over, plan, and shop from our produce lists every week like we would with any other restaurant or grocer. Also, since the product was paid for by CSA members, CRRI received top shelf quality stuff for their clients. We raised $1,200 and added 10% to each order for a total of $1,320 worth of produce in 2018. We got a lot of positive feedback from the kitchen and will be excited to try this again next year. For now, let us just say Thank You for your kind support of this important organization and our farm. Writing reflective blog posts can be a little tedious. In the past farming seasons seemed to fly by me, scorching along at record paces and leaving little time for reflection. Nowadays, with a more reasonable amount of help in the ordeal I find that I can take in more of the goings on through the calendar. Also, thanks to Mindy teaching me Mindfulness practices, I am present for at least some of the time. Occasionally I have the opportunity to teach. I some times am invited to speak at Organic Farming or Landscaping Conferences on subjects ranging from “How to Grow Brassicas” to “Understanding the Soil Food Web” and so on. 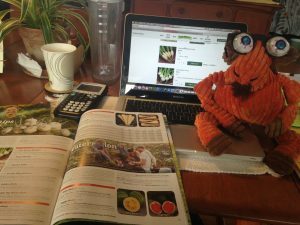 I also teach a four-class Course of my own design on Soils, Plant Biology, and Organic Farming Methods every spring. I love teaching in no small part because of it’s ability to bring me totally into the present moment. When farming I have a To-Do List a mile long. I have a binder full of scheduled appointments (seeding, marketing, etc) two-inches thick. 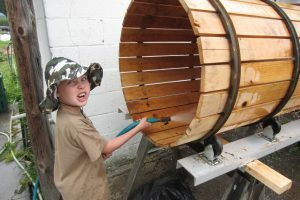 When organizing a job for myself and/or members of my crew I have to consider the next job that follows and usually one or two more related tasks to that one we are embarking on in the present. With a crew of several employees and sometimes as many as a dozen volunteers to manage I often have to make arrangements like this two or three or four times at once. So if you do the math that can be as many as twelve different steps that have to be considered and anticipated all at the same time. A memo pad in my back pocket is how I accomplish this. But, as you might be able to imagine, it can be very distracting to juggle all these things and can lead to a perpetual mindlessness, always a step or two ahead of where you are presently. Being more involved in teaching and learning has been a goal of mine for many years. I have attempted to bring college students to the farm and compensate them with work-study hours in return for hours spent on farm research projects. 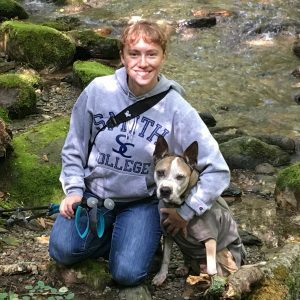 In 2019 I am hoping to go a step further and do something a bit more formal that helps expand my understanding of soil science, plant biology, and organic farming. We’ll see how well I can balance that with all the demands of the farming season which can get more and more complicated every year. More emphasis on streamlining will continue as we work towards a simple model that results in vigorous, productive soil and excellent crops for ourselves and our customers. Another Summer/Fall CSA season is wrapping up. We are, as always, incredibly grateful for the support of our CSA members. Some of you have truly become friends and family. Many of you have expressed the satisfaction the CSA brings to your lives. Nothing is more rewarding then hearing about young children being raised on our vegetables, or about how fresh vegetables brought into people’s diets has improved the quality of their lives. We are so touched to be able to be a part of people’s sustenance and to reunite people with what food is supposed to be. We are looking forward to serving many of you this Winter and many of you the following Spring/Fall season. We wish you all a safe, fun, productive and/or restful winter. Please share your thoughts with us over the off season. We do much planning in the winter time so if you have any ideas for next year now is the time to let us know. With the arrival of Fall it is time for us to start thinking about the impending Winter. I know many of you might dread the coming cold months, but we farmers typically see Winter as a reprieve. 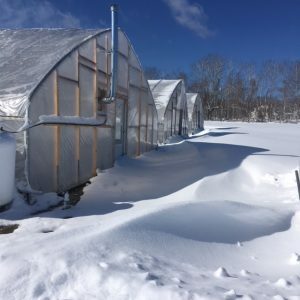 With the fields frozen or blanketed with snow we turn to our high tunnels (un-heated greenhouses) for fresh greens and to our storage vegetables for Fall harvested vegetables. We offer these items in a Winter CSA Share so that you can enjoy farm-fresh vegetables through the cold months of the year. 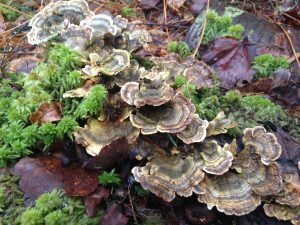 We have been offering Winter CSA Shares for several years now and we have improved the share every year (in my opinion) offering more variety and more of what people want. We have also come to understand what crops store well and which don’t under our circumstances so that we are getting you stuff when it is in it’s prime. This year we will be offering more potatoes, beets, and rutabagas as these have been popular in the past. We will also be offering more spinach and kale as well as micro green salad mix. Details: The Winter CSA is a 14-week share that runs through December, February, and March (no pick-up in January)… We condense the weekly shares into one pick-up every other week. This way you will not have to travel to the pick-up every week but will pick up two weeks worth of vegetables at one pick-up. The crops we are selling in the winter will last for a long time in your fridge so you don’t have to worry about things spoiling over the two weeks. We will be pre-bagging the shares, so you will simply come to the pick-up and we will pass over your bags. What’s Offered? 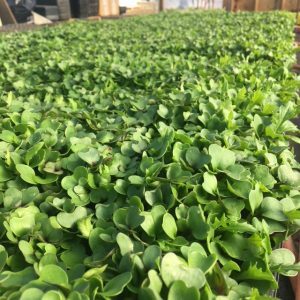 We will be offering winter-harvested greens from our greenhouses every week such as kale, spinach, and micro greens as well as onions, potatoes, rutabagas, carrots, beets, sweet potatoes, leeks, celeriac, fall radishes, turnips, daikon radishes, winter squash and parsnips. In early December and late March there may be some other hardy vegetables available as well. Where and When? Pick-up will be at the Bell Street Chapel (5 Bell Street Providence) on Thursdays from 5-7pm (the pick-up window is tighter, please be aware). If you would prefer to pick-up at the farm we can leave your bags in a cooler. The dates will be as follows: Dec.6th, Dec. 20th, Feb. 7th, Feb. 21st, March 7th, March 21st, April 4th. There is a limit of shares that we can accommodate in the winter so sign-up early! Payment can be made anytime between now and the first pick-up. Payment plans are also available. Spring is trying to break out of Winter’s rugged grip! We are still having very cold days and there is even more snow in the forecast today (April 6th). But Winter has no choice in the matter, it must relent. The sun is slowly creeping higher and higher into the southern sky. Snow can fall by the buckets but it can’t resist the stronger angle of the sun and the, soon anyway, warmer temperatures. So we farm on and get ready for the planting blitz that will soon erupt as our fields dry out and become accepting of tractor tires and muck boots. 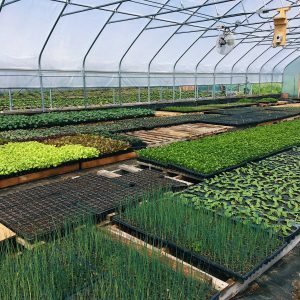 Our propagation greenhouse is stuffed to the gills once again as we wait for spring to break loose. Normally we would feel comfortable bringing trays of hardy stuff outside to harden off before planting but not this year… still too cold. Instead we are finding corners of the greenhouse we didn’t know existed to stick eager plants. Tomatoes are filling their plug cells and will soon be moving into the high tunnels where they will be until October. Basil and spinach await to be buddy-planted with them. 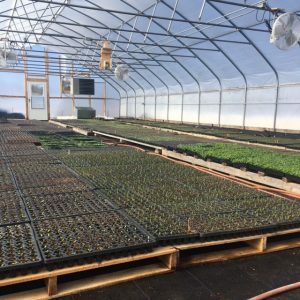 The first plantings of head lettuce, mesclun lettuce, beets, radishes, and greens are almost ready for their voyage into the fields and high tunnels. Young carrots are popping up and the garlic has emerged from it’s Winter slumber. The rhubarb, parsnips and burdock also are starting to demand attention. Plants and people are eager to get busy this time of year. We have our crew all hired up and ready for business. 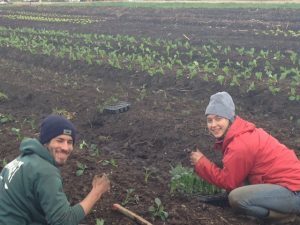 Work-shares are starting to join and re-join our CSA program for 2018. Having our weekly visits from our Work-Share members is one of the highlights of the farming season. So many people are eager and happy to be outside and take part in growing some of their own food. We’re looking forward to getting back together with our long-term volunteers and getting acquainted with our new folks. We are really excited to move forward with some of our goals in 2018. In particular we are trying to get some traction in regards to a project that will link organic farms with local shelters and soup kitchens in order to supply top-shelf, consistent deliveries of farm fresh produce while also compensating the grower. We are trying to build a Community Advisory Board of farmers and homeless advocates in order to higher someone to manage funding for such a project. Have something to offer in this regard? Get in touch with us for more information! 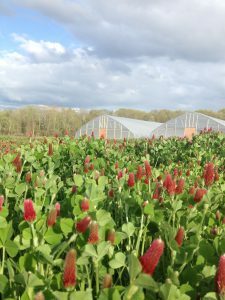 We thank you for your support of our farm, either through our CSA program, our accounts, or simply by reading this blog. Spring is a time of great anticipation and promise. We hope that your goals and aspirations for 2018 come true and you have great success in your endeavors. Good luck in 2018 Everyone! That is a lesson that I always have struggled to actualize. My new mantra is “switch the tags”. Making things easier on themselves should be every farmers priority. But with all the big and little things to do it’s easy to barge ahead like a rhinoceros. The first wave of seeding has begun. My good pal Jeffrey came out during his winter break from teaching to help me shlep pallets in the mud. 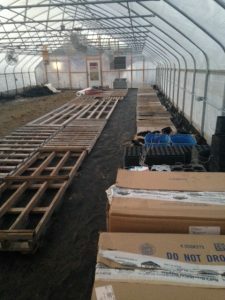 Now all of those pallets are covered with seedling trays. Onions, leeks, celery root, parsley, celery, beets, lettuce, micro greens, salad mix, tomatoes, and flowers are all settled into spring potting mix. 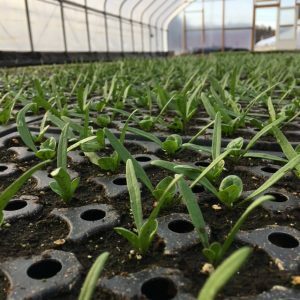 Next week we will seed our first planting of spinach and watch as our first planting of carrots germinates in our high tunnels. 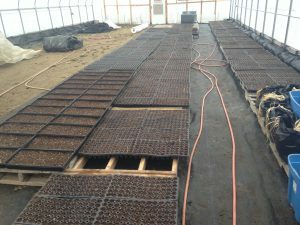 From this point we will be seeding in the greenhouse until Oct, making a constant succession of vegetables for our customers and ourselves. We have so many exciting projects to look forward to in 2018 it’s actually hard to know where to begin. 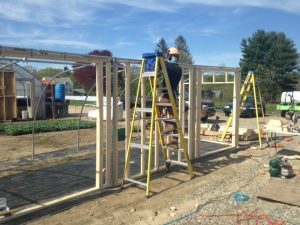 Our biggest projects for the spring include building another 96’x30′ high tunnel, a tool shed, and a lunch shed. We have to clear about a 1/4 acre of woods to expand our chicken and compost yard. We’ve got piles of brush to burn and workshops to prepare for. 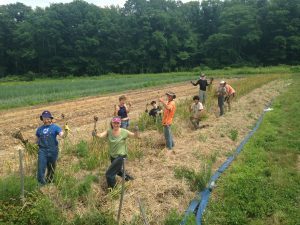 Our seventh annual Soil, Plant, and Farm Methods course is coming up as well (always a lot of fun). When the ground drys up we will be preparing raised beds over the whole farm for our annuals and also be putting in some of our first perennial crops (strawberries, rhubarb, elderberry and asparagus). It’s an exiting time, with lots of promise. The seasons operate like this in my mind: the promise of Spring, the reality of Summer, the glory of Fall, and the relief of Winter. Spring is the time to lock down your plans for the year, arrange your ducks, and start movement in the right direction. As the pace picks up you have to sometimes remember to, simply, move the tags. 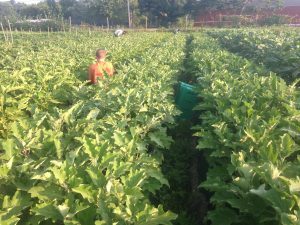 In 2017 we began a conversation with Don Liberte and David Rocheleau from Crossroads about how to get high quality, organic produce to the neediest people in our community. 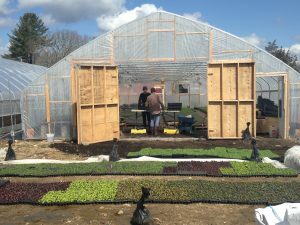 How can an organic farm directly impact homelessness in Rhode Island? Establishments that serve homeless and persons in need are in a unique position to provide nourishment. Cafeterias and kitchens that serve these populations often rely on donations and/or small budgets. Under these circumstances the best quality food is often overlooked in order to simply provide volume. As we all know local, organic produce is not affordable for everyone. 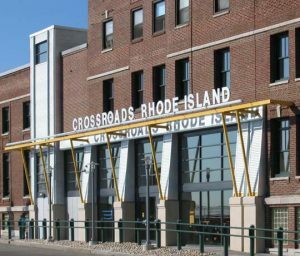 We are attempting to raise $4,000 this winter and spring to support a weekly delivery of Big Train Farm produce to the Crossroads RI kitchen and possibly Food 4 Good food truck as well. 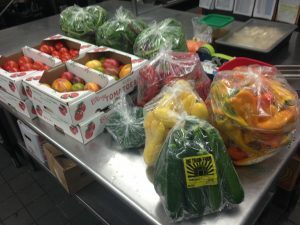 The produce will be delivered fresh every week during the main growing season (June-Nov) and, if more funds are made available, we would like to continue providing produce through the winter and into the spring. We are asking for our CSA members to contribute a donation, either big or small, to this cause. We believe that we need to make healthy food available to everyone and we think you probably do too. Farm Fresh RI has pledged to support us in this effort as well. Please make a donation when you sign up for your CSA membership in 2018. Big Train Farm will match 10% of your donation with extra produce each week to the Crossroads’ kitchen.